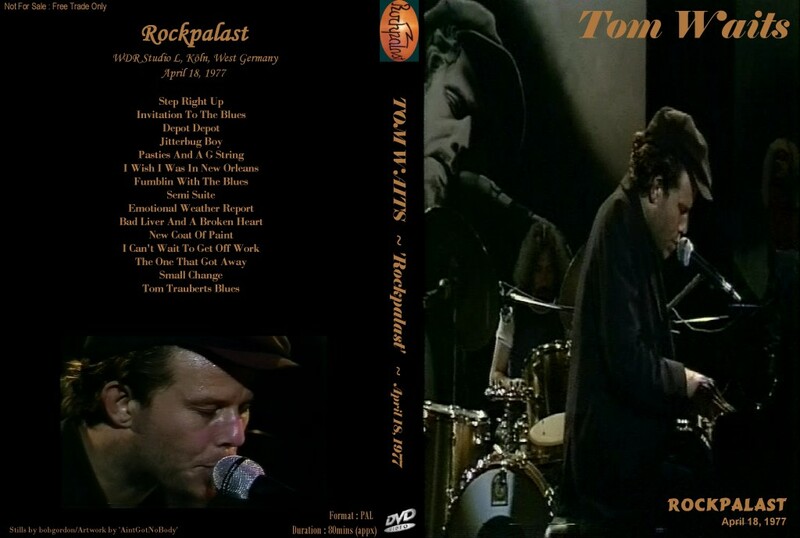 Excellent quality recording of Tom Waits, live at WDR Studios, in Koln, Germany on April 18th, 1977. Running time is 79 minutes, the quality is 8 out of 10. The performance is great, classic, jazzy Tom Waits. I’ve collected the whole show into one playlist. Rockpalast (Rock Palace) is a German music television show that broadcasts live on German television station Westdeutscher Rundfunk (WDR).Rockpalast started in 1974 and continues to this day. Hundreds of rock and jazz bands have performed on Rockpalast. Some acts were recorded for broadcast and for retail sale. All-night marathon shows called “Rock Night” (Rocknacht) were produced once or twice a year from 1977 through 1986 and simulcast throughout Europe via the Eurovision network of TV broadcasters. This was one of the most important influences on my musical education growing up. I longed and lived for those “Rock nights”. We all did, and we arranged all night parties when they aired. Ah, good times! This is early jazz-quartet style Tom Waits as opposed to the more ragged and loose Waits he turned into after Swordfish Trombones and Rain Dogs. It is different but I love both eras. This is maybe the best tv-concert from that period.